Derbyshire have signed experienced batsman Daryn Smit on a two-year deal until the end of the 2018 season. The 33-year-old South African, who has represented the Proteas A side, has played Lancashire League cricket in England for the past three seasons and joins as a non-overseas player. Smit has played 125 first-class matches, scoring 5,711 runs at an average of 37.32. 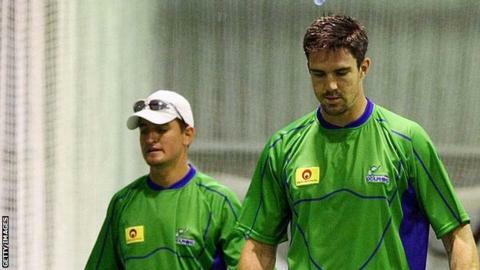 Director of cricket Kim Barnett said Smit was "vastly experienced". "He has over 14 years as a professional and will strengthen the depth to our batting line-up," Barnett added. Smit, who impressed during two Derbyshire Second XI appearances last season, has played for the Dolphins in his homeland for 14 seasons. Smit added: "I've enjoyed my time with the Dolphins, and I'm extremely grateful for the opportunities they gave me. "I'm delighted to join Derbyshire and get an opportunity to play county cricket."